Starting from Taman Negara, Kuala Tahan (Floating Restaurant) on the first day at 10:00am. 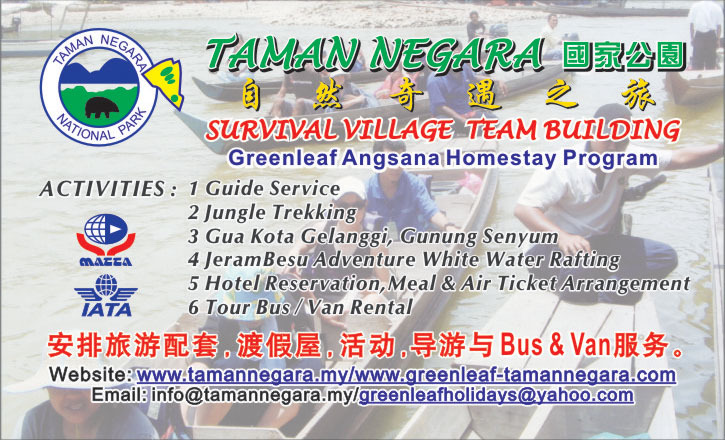 This value package includes Guide, Boat, Food and Camping Equipments. What do yo need to bring? Here is the list, Sleeping bag, carry metre, mineral water, daily tools for meal such as cup, plate, spoon and so on. *You can exchange with other activity or accommodation on request or mutual agreement towards the price. 10:00am Prepare your bag (packing) and meet your guide at floating restaurant. 11:30am After check in at Wildlife department, Boat to Kuala Keniam Lodge (2 hrs). 01:30pm Packing lunch before start trekking. 02:00pm Trekking 5 to 6 Hours to Gua Kempayang Besar Big Cave (include stop & rest) . 07:30pm Reach and stay overnight at Gua Kepayang Besar. Cook Dinner with guide and free activities. 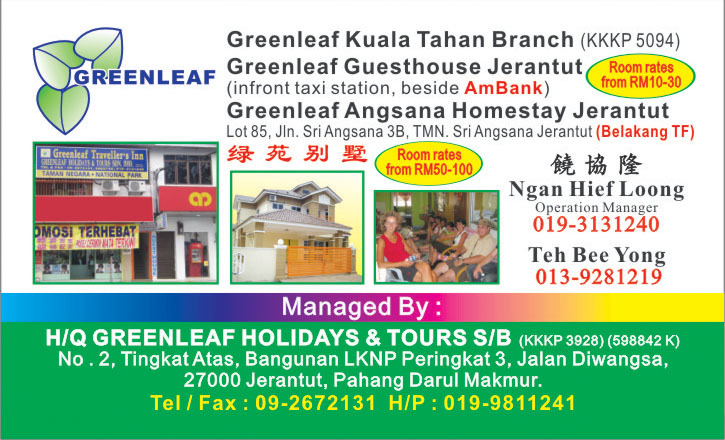 09:45am Depart from Gua Kepayang Besar to Kuala Trenggan (Trenggan Lodge). 01:30pm Lunch at river site, after lunch start trekking to Kumbang Hide. 05:00pm Stay over night at Kumbang Hide or stay at Aborigine Settlement. Wildlife talk or observe wildlife. 07:30pm Enjoy cook dinner with guide. 09:30am Start trekking to Trenggan Lodge. 01.30pm Packing lunch before start trekking. 05:30pm Reach at Gua Kepayang Besar. Stay overnight at Gua Kepayang Besar. Cook dinner with guide. Wildlife talk and observe wildlife. 09:45am Trekking from Gua Kepayang Besar to Kuala Trenggan (Trenggan Lodge). 01:30pm Continue trekking to Trenggan Lodge. 04:00pm Reach at Trenggan Lodge. Bot pick-up from Trenggan Lodge to Kuala Tahan. Tour ends. Boat Ride 2 hour to the upstream of Sg Keniam and the sceneric beauty of our rainforest. Enjoy the panoramic view along the river bank. Mean during through the Tembeling river. Enjoy the sound of the jungle. Rapid shooting in the cruise owards the trenggan river in a wooden Boat. Guide, boat, meals, drinking water,camping equipments, sleeping bag (if you'e particular about bringing your own)and cooking gear.